With their contemporary, open plan design, these bright and spacious, serviced apartments are perfect for a short term let in London. They are right in the heart of the West End, just off Oxford Street, famous for its great shops including the iconic Selfridges. Large windows give these apartments a really light and airy feel. There's a choice of studios, one and two bed apartments, each with a luxury bathroom and fully equipped kitchen with dining area. Beech, hardwood floors and stunning prints by contemporary London artists complete the modern look. All London short stay have digital TV, internet access, DVD and CD players, as well as a mini safe, direct dial telephone and entryphone. There's a weekly maid service and linen change and a member of staff providing 24 hour assistance. 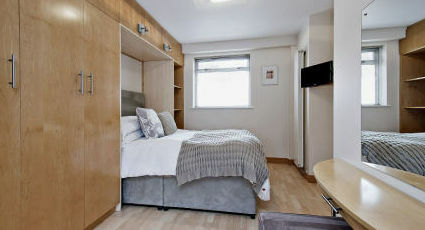 Airport transfers, childcare, laundry and welcome packs can be arranged at extra cost.These short stay apartments are minutes from Oxford Street, Bond Street and Regent's Street, right in the heart of the West End. Top restaurants, bars and cafes are nearby as are London's best theatres and venues. Bond Street tube station is within two minutes' walk while Euston and Kings Cross St Pancras mainline railway stations are a short taxi ride away.